RESTORE evaluates the costs and benefits of energy storage in the transition to a low-carbon, high-renewables grid, co-optimizing the dispatch across energy, capacity, and ancillary service markets for transmission, distribution, and customer-sited energy storage. Current markets do not fully capture the benefits of energy storage; doing so depends on highly uncertain policy and market drivers. 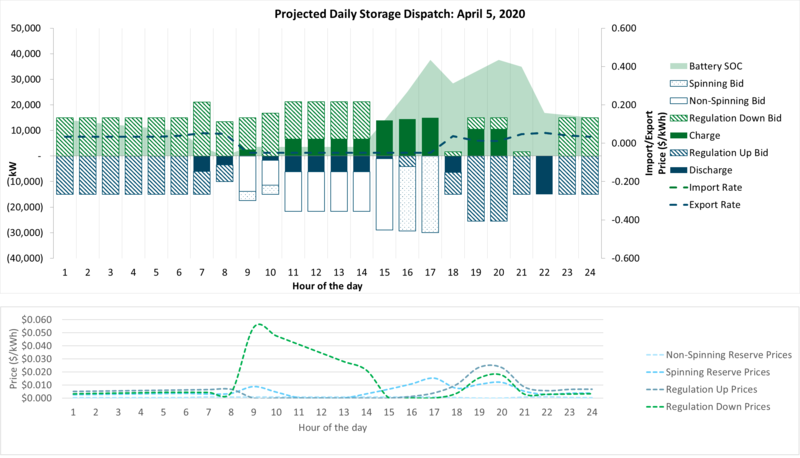 Using market price projections developed with insights from our REFLEX and RESOLVE models, RESTORE shows the future value of energy storage in a low-carbon, high-renewables grid that conventional utility evaluation protocols do not adequately capture. RESTORE also incorporates E3’s industry-leading expertise in distributed energy resource planning to fully capture the local distribution and ratepayer impacts of behind-the-meter storage. Since 2014, we have used RESTORE on behalf of technology firms and project developers to assess the potential value of Li-ion flow batteries, compressed-air energy storage, and pumped hydro for utilities and commercial customers. We have also applied the model to develop negotiating and bidding strategies for project developers seeking contracts with utilities. For an in-depth overview of RESTORE and E3’s energy storage capabilities, click here. E3 used the RESTORE model to project how utility-scale flow-battery storage would be dispatched in the California ISO’s energy and ancillary service markets. RESTORE shows the future value of energy storage in a low-carbon, high-renewables grid. For more information about RESTORE, contact Snuller Price or Kush Patel.